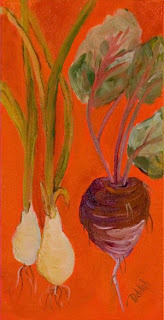 Fresh Vegtables a new painting for my Organic series. Gallery wrapped canvas with painted sides. Thw back is wired and it is ready to hang. oil on gallery wrapped canvas wired and ready to hang. Oil on canvas mounted on RayMar panel 10x12 ready to frame. Birthday Cupcakes III celebrate your birthday with a small daily oil painting. Today was the first paint out of the Great Lakes Plien Air Painters Association . The day was cold and windy but I did do 2 paintings this is one of them. 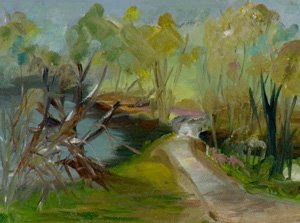 It is a 6x8 on canvas mounted on a RayMar panel. gallery wrapped oil with painted sides and wired ready to hang as is or it may be framed. 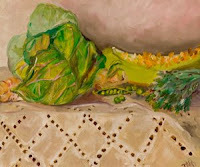 At first I was thinking of painting several cloths pins when I stated this painting. I may go back and do one like that or several it is an idea that I would like to work with a little longer. 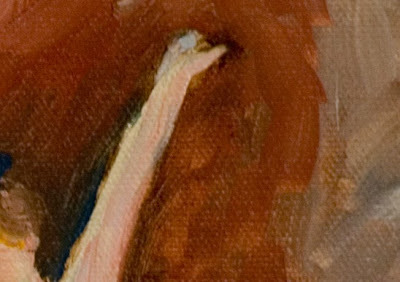 When I started to paint this I got to thinking about when I was a kid and my Mom would hang out cloths in the summer and how little birds would come and sit on the cloths line and watch her. It brought a smile to my face and I had to put a little bird in the picture. Home Grown 12x6 oil on gallery wrapped stretched canvas with painted sides. The back is wired and this painting can be hung as is or framed if you like. 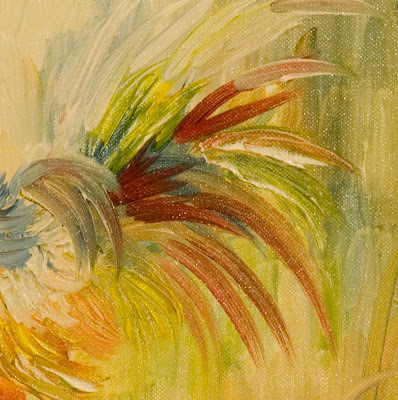 Chicken Pen 9x12 oil on stretched canvas with staple free sides. Daffodils and Fruit 9x12x1 1/2 oil on gallery wrapped canvas. The back is wired and this painting is ready to hang. 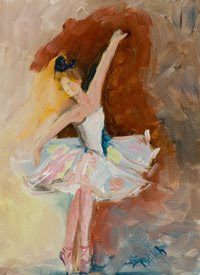 Ballerina 3 is done on canvas mounted on a RayMar panel it is 8x6 and is ready to frame. 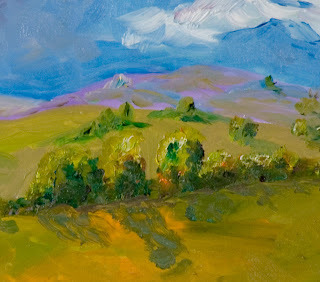 For more details on this painting please visit my blog. 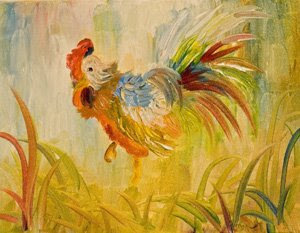 Rooster Dance 11x14x3/4 oil on gallery wrapped stretched canvas wired and ready to hang. 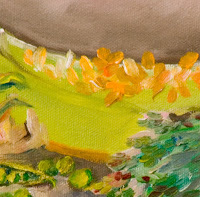 For more details on this oil painting please visit my blog. 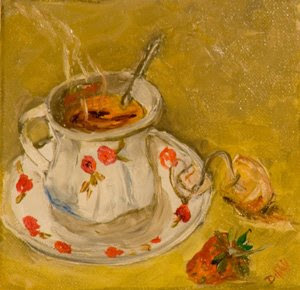 Tea and Strawberry 6x6x1 1/2 oil on gallery wrapped canvas.The sides are painted and the back is wired so the painting can be hung as is or framed if you like. 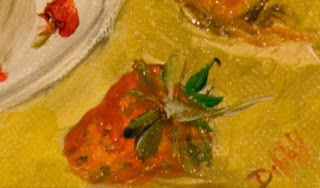 Table of Vegtasbles is an oil painting done on canvas mounted on a RayMar panel ready to frame. 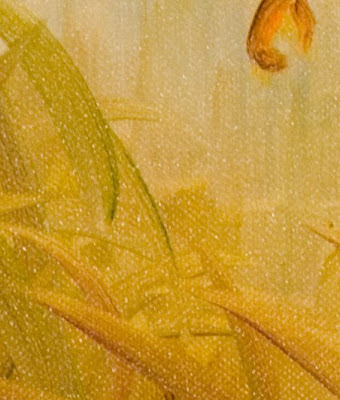 This painting is 10x12. 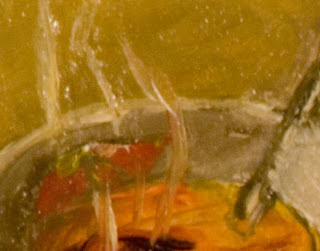 If you read my blog you know I am a farm girl so cows are something I love to paint. Cows in the Pasture oil on hardboard 8x15 ready to frame.